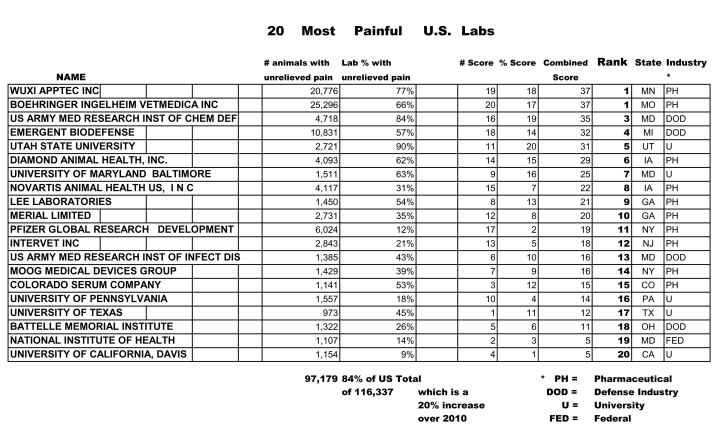 These US laboratories used the most animals in painful experiments without anesthesia. They are responsible for the majority of unrelieved pain in experimentation for animals in the US. Below the table you will find links to the individual reports which contain information on which species of animals were used, and some data on the kind of experimentation. Everyone has the right to know this kind of information and at SAEN we want to make sure it is available. Please read 11 Every Hour.